Been trying out some new vid cards. At first, I installed a Sapphire NITRO+ Radeon RX 480 4GB and it ran great. Great on the burn in, and great with memory consuming games like DOOM, but when I would go into FOB on MGSV the fan would spike to 100% and go into an infinite loop error. I would shut the game and bring up Trixx to try adjusting the fan, but it was unresponsive and would blue screen. I figured it might just be a minor fix, but I looked and saw that lots of people were having the same problem. IT was possible a format could have fixed it, but I decided to unload it before I was stuck with it. It was a great card, but it was either defective, or it was flaky as hell. Now I have the MSI GTX 1060 GAMING X 6G installed. I went with a different chipset to avoid the potential that all the 480's would give me the same result. The 1060 is a great card in many ways, but the fans! I can't hear them no matter what... they are like, totally silent! All games are running good and there doesn't seem to be any issues, but when I ran the burn in, I noticed that some parts of the cabinet were getting warm towards the back of the rig near the card. This is of course when I was demanding 99% of the GPU with furmark for 10 minutes. Is that something that could become an issue? should I set up another fan, or worry about it? I doubt many games will call for that much power, but if it did, is such warmth on the back of the cabinet generally something to worry about? I only ever hear my 980 fan on boot. Once the system is loaded the fun goes into "I'm bored" mode and shuts down. Maybe with my new monitor on the way I can push the 980 enough to wake the fan up from being lazy. Ok, where is the real Jafo? 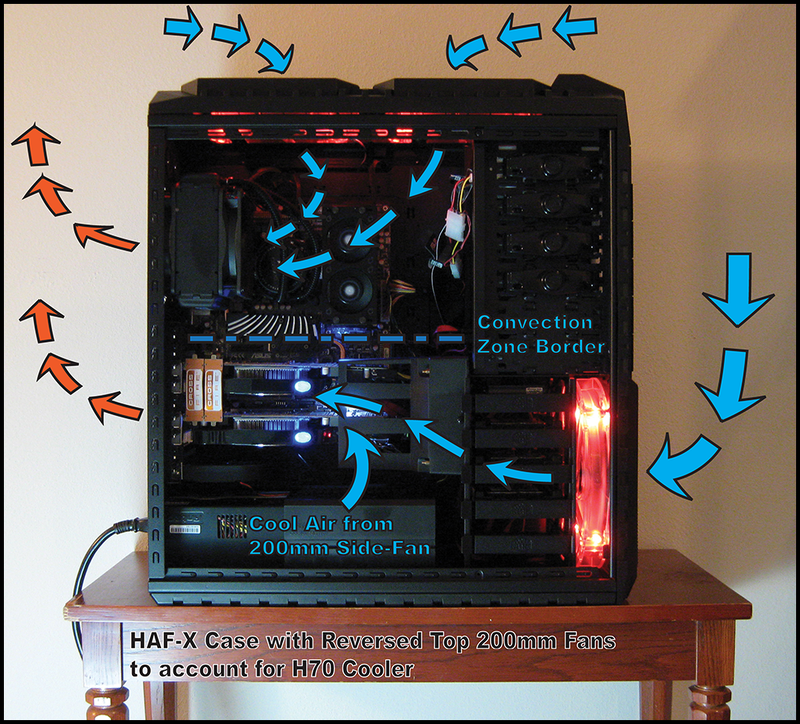 Yeah, so I guess I'll order another fan for the front so I have 2 and maybe turn up the speed with the mobo utility. I could always add a fan from the bottom and 2 on the top. Having a warm case is a foreign concept to me, but it's probably not problematic as far as the video card is concerned. You're only hitting 61C on a burn in test, which is a whopping 1 degree above the fan shutoff, as in you aren't getting any temperature climb at all once the fan starts running. I'm guessing you could run a burn in test all day and still not overheat the card. How are your fans setup? I have a Fractal R4 and I have 1 fan at the bottom front and one at the top back. I replaced the stock fans with Noctua 140mm. They were good enough for my last 2 cards, but this one probably pushes out more heat. I was thinking I would order another one for the front and maybe turn up the speeds a little. If that doesn't work I could always open the top or go from the bottom as well. Yeah, so I put another fan in the front for 2, opened up the top and put 1 fan there, and put in a NZXT Sentry 3 to increase the speeds to 1500 when necessary. After that I ran the burn in and the hot spot was gone. The case still has some warmth, but no hot spots or anything that appears unusually high. I can always put another fan at the top for 2 and 1 at the bottom if the case needs it, but it seems like the airflow might be OK for now btw this MSI card shreds... great card! and I can't even hardly hear it. Most cards sound like the indy 500 when put to the test. What kind of fans do you use? I have the Noctua's which are really very quiet. They aren't even bad at full speed. Was thinking about installing a liquid cooler for my cpu, but the horror stories of leakage have made me reluctant. Is there anything in the second PCI-e slot that might block the fans of the GTX1060 ? cables - audio cards ? Furmark is very demanding and in most cases the GPU will never encounter such demand unless you set it to DSR. Edit: I use Noctua Fans aswell have five of the 140´s and my cpu cooler is an NHD14 had one of those installed in my old 6600k system, it is the "block" of awesomeness. what type of case do you use ? Is the case coated in insulators to keep it silent? I have a smiliar setup like this just without the sidefan but with an additional front 140mm fan. My case has a lot of insulators if that is the propper term in english and what i noticed is that the sidepanel can get warm but that is connected to the insolators that store heat therefore i must have additional fans to compensate. Something that might helps is that hot air rises; while, cold air falls. One way to definitely isolate heat sources....compartmentalize to-the-max. All 'inlets' are below the compartments...all outlets are at upper-rear. Thanks for the tip Benmanns, but I think I will use the top to exhaust the heat. It seems to be working pretty good. I could always bring in more cool air from the bottom in the future. Hey Jafo, is that your new rig? very nice! where is that case listed? Just for curiosity and to see its specs. Yes....it's my 'new' one....almost a year old now though. The case is a Limited Edition [it'll be sold out]. There were 500 world wide. 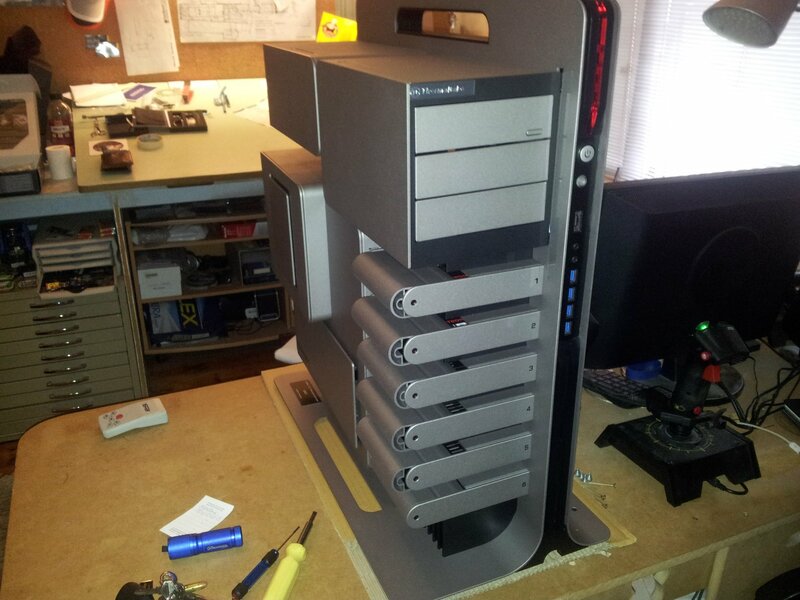 Probably 95% of computers cost less than just this case alone. Thermaltake Level 10 Limited Edition Titanium [it googles]...about $1300 AUD. Thermaltake Level 10 Limited Edition Titanium [it googles]...about $1300 AUD.